You probably know by now that Opal, Edna, and I have been best friends ever since we met in kindergarten. Halloween has always been one of our favorite holidays. Beginning with that first year, we’ve concocted some of the weirdest costumes imaginable. And imagination was the key—people often had to ask us what we were. The good thing about going out as three little kittens or three blind mice was that if we recited our poem (the trick), the kindly people offering us trays of goodies (the treat) may have been able to figure out what we were attempting to represent. (But really, why did Opal and Edna insist that I had to be the only mouse with a lopped-off tail?) Reciting The Three Musketeers would have been problematical. That year, we handed out chocolate bars to the folks who opened the door at our knock. That surprised them! Now that we’re adults, shelling-out probably gives us more treats than trick-or-treating ever did. Kids frequently arrive in stunningly original outfits, and some of them recite a verse or sing a song the second we open the door. Oh, and occasionally we end up with a leftover treat or two, but really, a nice glass of sherry at the end of the evening is enough for me. Dogs can really get into the spirit of helping me answering the door and greeting the kids. Dressed as a pumpkin, my very sweet old dog obviously believed that these costumed tykes were coming to pet her and bring her candy. One Halloween, she dipped her nose into a toddler’s bag and brought out a candy. The pint-sized pirate didn’t notice, and probably wondered why I gave him two chocolate bars. Then there was the tiny two-year-old tiger in a baggy fur suit who didn’t quite understand the technique of trick or treating. She simply walked in and began touring the house. This year, Opal, Edna, and I helped the neighborhood children create their own costumes. I own a quilting shop, and one of my little customers is dressing up as a Murphy bed, complete with a quilt he pieced together in my class. He explained it to me as earnestly as only a ten-year-old can. When people come to the door, he’ll pull the ropes he plans to rig up, the bed will drop out of its closet, and a bag will open on the quilt for the treats. I can hardly wait to see this. What treats have you received from trick-or-treaters? You can learn more about Naomi and how she and her friends helped Willow catch a murderer in DIRE THREADS, available in stores everywhere. 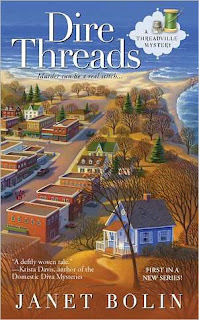 And watch for THREADED FOR TROUBLE, coming in June 2012. I love the idea of the Murphy bed! The best treats I get are the squeals of delight from the younger trick-or-treaters. Everything is exciting to them. Unfortunately, I wasn't looking at the TV during last night's news when the reporter asked a first grader what her costume was supposed to be. She answered, "A stem cell." I wish I'd seen *that* costume. Naomi, I saw that news cast... my immediate thought was, that kid's parents are doctors!! I went out trick or treating with my three little cousins once, so it was one Senor wearing a sombrero and serape, (less enlightened times, as far as costumes go :-( ) and three ghosts of diminishing heights! My daughter and a friend went out as a pair of fuzzy dice one year. That was an interesting costume to make! That does sound a bit dicey, Sheila. Naomi, I can't begin to tell you how many fairies and princesses I see every year. And now all the vampires! What a combination. I remember my Wonder Woman costume. I felt so powerful in it. ~Charlotte, who can't wait to visit Threadville! Charlotte, there's nothing quite like going wild with makeup, unless it's going wild with fabrics, of course. See you in Threadville--or Providence. We really live quite close to each other! Halloween sounds like great fun at your house, Naomi! I love to go trick or treating and get all dressed up! Joyce, I fear that my friends and I will use *any* excuse to make and wear costumes.